Now, class, if you've been reading in your textbooks, you should already know that these million-dollar golf manufacturers like Tour Edge use these hi-tech materials to manipulate the weight of the clubhead to give us a low center of gravity, a high MOI, and a big, hot sweet spot (skip down to the bottom for more on this hot, "boomerang"-shaped clubface). 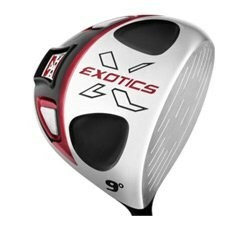 This XCG-4 has a very high launch with very little spin, resulting in long drives that don't slice or hook too much. This comes from the mix of heavier tungsten and lighter carbon fiber, which creates the aforementioned low CG. The cool thing about this particular driver is the hot clubface. Tour Edge has created a big spring effect by giving the face thicker areas that are shaped like a boomerang. This increases the trampoline effect and helps with feel. I like the light version (less than 280 grams). I don't like the tinny noise it makes on impact.